Cannabis Oil for Migraines: Is it Worth a Try? You’ve probably heard at least a little bit about medical cannabis oil (or cannabidiol, also called CBD). It’s been widely covered in the news as an effective treatment for conditions like epilepsy, but iat’s being studied for all kinds of other ailments, too. In recent years, science has begun to give cannabis more careful study as it shows promise for different conditions. But what about you and your migraines? Is cannabis oil for migraines really a thing, and is it the right thing for you? Before you decide, there are a few things to understand. Let’s clear up this common misconception. Cannabidiol (or cannabis oil) is an extract of a plant called Cannabis Sativa. This plant and the drug derived from it is commonly called marijuana. However, the Cannabis Sativa plant includes about 120 other substances aside from CBD. Cannabis is an isolated extract; just one of many elements that comprises the whole plant. Not only is cannabis just one of many substances in the marijuana plant, but science has proven that it’s not the one that gets you high. The high-inducing substance in marijuana is called tetrahydrocannabinol, or THC. This chemical — not cannabis — is what causes the psychotic effects (and the munchies…or so we’ve heard). In fact, cannabis or CBD alone has actually been found by clinical study to have antipsychotic effects that can prevent the symptoms caused by high doses of THC. The bottom line: cannabis oil is an isolated extract from the Cannabis Sativa or marijuana plant. It is not marijuana and will not make you high. It also has an established track record of safety, and potential side effects are mild, including changes in appetite, fatigue, and diarrhea. In a study conducted by the World Health Organization, cannabis oil was found to be non-addicting. The double-blind, randomized study found that, on the scales of the Addiction Research Centre Inventory, there was no difference in addiction risk between CBD and the administered placebo. Is There Proof Cannabis Oil for Migraine Works? Documented studies show good results when evaluating cannabis for its effects on chronic pain. A study conducted in 2012 found cannabis effective in relieving chronic pain and inflammation, such as arthritis and multiple sclerosis. A 2009 study found it may help long-time opioid users reduce their need for these powerful pharmaceutical pain relievers. To date, cannabis oil for migraines specifically hasn’t been studied in its isolated state. However, cannabis in combination with THC has shown promise for migraine relief in clinical study. While we wait for documented studies on CBD and its specific effects on migraine, many migraine sufferers are trying it for themselves with good results. With a Google search, you’re likely to find many personal stories from people who have found cannabis oil for migraine a promising treatment. For example, one story was sent to us by Kate. “I have struggled with migraines since I was about 12. When Axon launched the CBD Oil I was one of the first customers. Actually, to be honest I was very skeptical. I have tried medicine, rest, darkness, vitamins, more medicine but nothing really relieved the pain and pressure for longer than a few hours. I didn’t like having to keep taking pills either. Nothing really had a great affect or worked well for me, so when I had the opportunity to try the CBD Oil, I decided to give it a go. I did not believe it would actually do anything for me. The day I tried it, I had had a migraine most of the day. I took 3 or 4 drops and waited. 10-15 minutes later, the pressure and pain in my head and behind my eyes completely left. It was like I hadn’t even had a migraine the entire day. Pressure gone. Pain gone. Spots in front of my eyes…gone. My head did not hurt the rest of the day. Now I have never tried anything like CBD Oil before. When I use my CBD now, I still don’t even take the full serving amount. I only use 3-4 drops at a time. But each time, within 10-15 minutes my migraine clears and stays gone for hours, if not all day. Just like any other supplement, where you purchase your cannabis oil for migraines can make all the difference. A recent study by the Institute of Research on Cannabinoids analyzed more than 80 CBD products, and found that a whopping 70% of them didn’t match what was on the label, containing either more or less CBD than the label claimed. As if that weren’t enough, 1 in 5 of the samples tested contained some level of THC, even though the label claimed there was none. 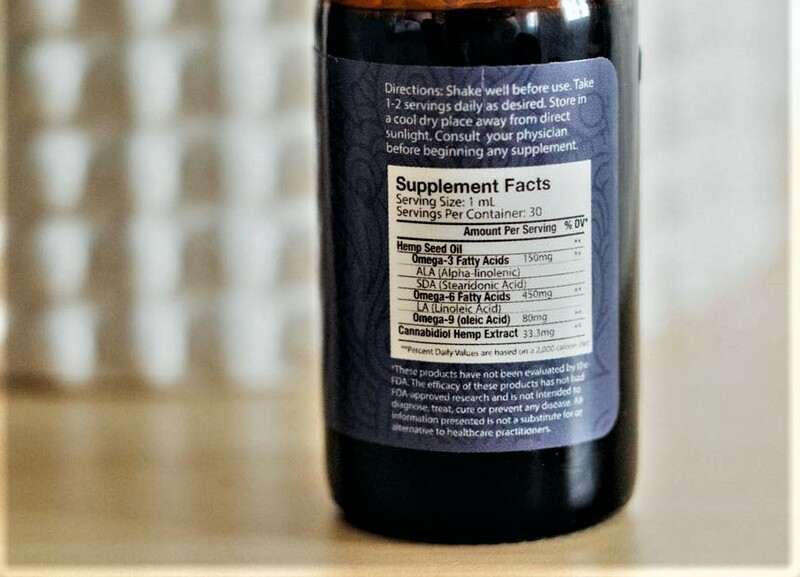 This study shows why it’s important to use a trustworthy source for any CBD supplement you buy. It’s also why Axon uses an FDA-registered manufacturing facility and 3rd party testing. Every customer deserves the pure CBD Oil and a label that tells the whole story. Migraine has a way of throwing a big, heavy wrench into your plans, making it hard to keep up with your usual activities. But with many migraineurs concerned about the side effects, heavy pharmaceuticals don’t always have to be the answer. While there is no recommended dose, CBD has been found to be safe even in high amounts. 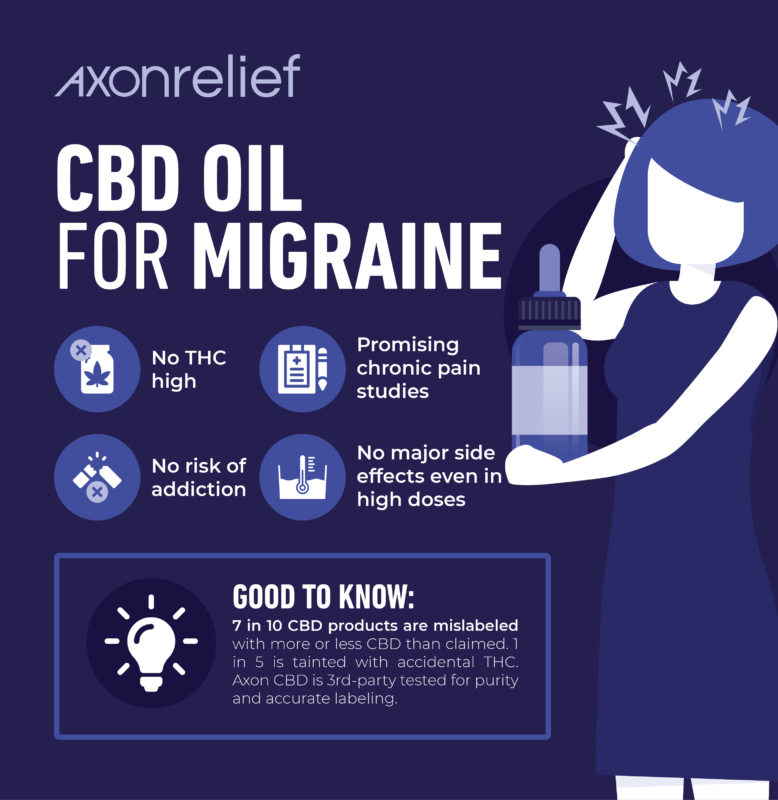 As a tool formulated specifically for migraine, Axon’s CBD Oil is considered a high concentrate with over 33 mg Cannabidiol per 1 ml. 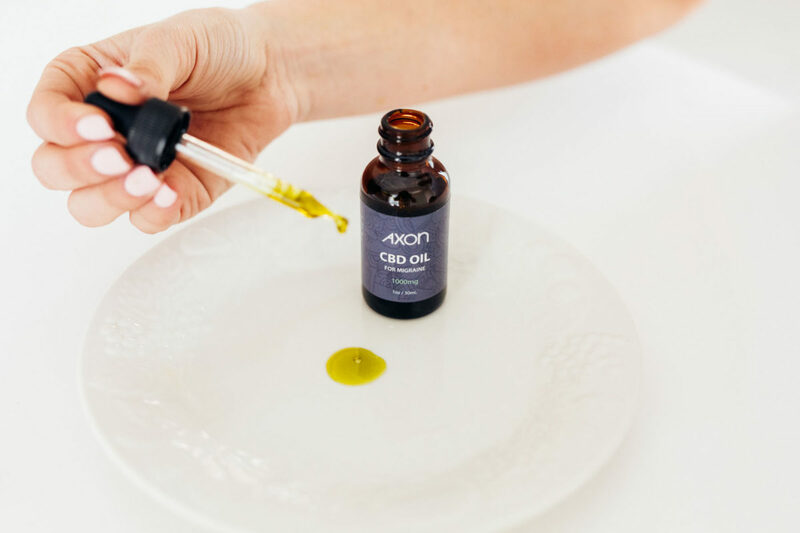 Other oils can contain as little as 3 mg. As with any supplement, we recommend following the label instructions for Axon CBD Oil and taking note of how you feel before making any personal adjustments. CBD Oil for Migraine: Trend or Treatment?